Salvation And Survival: "Glory To God In The Highest, And On Earth Peace Among Those With Whom God Is Pleased"! "Glory To God In The Highest, And On Earth Peace Among Those With Whom God Is Pleased"! These words from Luke 2:14 are spoken so often during Christmastime, and usually stated as the more casual "peace on earth, good will towards men". But do we Christians really know the context in which these words were proclaimed by the heavenly host, God's angelic army? I would surmise that most people interpret this verse to mean the angels are announcing the peace among men that the birth of the Christ child signifies, resulting in feelings of goodwill among mankind. But I believe that is a shallow explanation of the Word, and rather self-centered. The focus then becomes about us and our feelings; and is even sometimes rendered to mean that this peace is only intended for a select group of people God has chosen -- the Elect if you are Calvin-inclined. And although I don't celebrate Christmas from the man-made holiday, materialistic shopping frenzy, and Santa Claus perspective, I do honor the birth of Jesus and the reason I believe the angelic host made their appearance to make this stunning announcement. (The fact that I also don't believe Jesus was born on December 25th, doesn't enter into the importance of this discussion. If you are interested in my opinion on this matter, click here). So, what is the underlying significance of this dramatic pronouncement? To whom does this "peace" refer, and what exactly does it cover? Rather than revealing tranquility and harmony between men as a result of the birth of Jesus, the peace that the angels were speaking of was actually announcing the termination of hostilities and ill will between God and man -- the conflict that had existed since Adam and Eve had betrayed God's trust in the Garden. 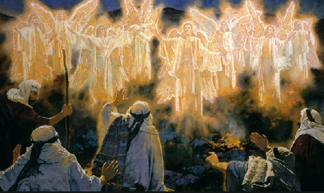 The angels were announcing that the Christ child was bringing reconciliation between The Most High God and His creation. Until God determined that it was time to end the hostilities, all men had been slaves to sin, separated from Him, and doomed for judgment and condemnation. But now it was time for the words of the Prophets to be displayed... Listen carefully, the virgin will conceive and give birth to a son, and she will call his name Immanuel (God with us) (Isaiah 7:14). The birth of this child will, in effect, make a way for peace between God and man. And even though man is unable to be completely sin-free, this child will pay for sin with His sacrificial blood; and all who have faith in Him as their Savior need not fear eternal damnation. By declaring "Glory to God in the Highest, and on earth peace among those with whom God is pleased", the angels are rejoicing in excitement and expectancy of what Jesus will eventually accomplish for mankind -- peace between them and God: Therefore there is now no condemnation [no guilty verdict, no punishment] for those who are in Christ Jesus [who believe in Him as personal Lord and Savior] (Romans 8:1). But there is more to this story than just the image of the Christ Child in the manger. There is a depth to it that we must not miss. It is imperative that we see the fullness of the Godhead in the particulars of this event. First, we cannot ignore the fact that the Father conceived this plan to send His only begotten Son as payment for the sins of those whom He dearly loved; that as the Son of God, this child was the sole representative of the Being and Character of the One who sent Him. Secondly, Jesus was the "Christ child", known as Jesus Christ, or Jesus, "the Anointed One". The word anointed means "consecrated" or "set apart" to a Divine purpose. In the religious ceremonies of the Jews, God instructed the "anointing" or "smearing of oil" to confer a divine or holy office upon a priest. Jesus was literally "smeared" with the power of Heaven from the moment of His supernatural conception. Born as fully human, He was able to accomplish God's plan of reinstated peace with man, through the power of Heaven initiated by the Holy Spirit. And from the moment of that Divine conception, the Holy Spirit and the power of Heaven played a central role in Jesus's ministry. According to Steven Studebaker, author and Associate Professor of Systematic and Historical Theology, "The Spirit is central to both who Christ is and what he did." The Holy Spirit not only enabled the incarnation of the Son of God, but He provided the power for Jesus to do the signs and wonders from the Father, virtually invading earth with the saving power of Heaven. Furthermore, if we, today, correctly view the birth of the Christ Child, we should recognize that this same Holy Spirit is central to our Christian identity and what we are able to do for the Father's Kingdom here on earth. If we are to be "those with whom He is well pleased", then we must mirror Jesus, whom God declared He was pleased with at His baptism. And that means being willing to activate the power that comes to us through the Holy Spirit. In that sense, we are no different than Jesus. He was given a mission which He accomplished. From the moment He was born, until His sacrificial death and resurrection, Jesus was born of the Spirit and filled with the Spirit to accomplish His Father's will. It is a given that we have not been divinely conceived. Only Jesus can lay claim to that distinction. And while we may not be continuously filled with the Spirit as He was, we have access to that same Spirit and the ability to achieve that goal ... if we desire it, and ask for it. That is God's intention for us and what would please Him! So, as we celebrate the birth of Jesus this year, let's try to look at this event as more than a nativity scene. Let us recognize that He came to us on a mission, empowered by the Holy Spirit to do the Father's will in bringing peace -- the reconciliation between man and God. And let us recognize that this same mission is still the will of the Father, and it is the mission we have inherited now that the Holy Spirit not only lives in us, but empowers us to do what God called Jesus to do. Contemplate the holiness of the Christ Child; His assignment; and the power given to Him to carry it out... all of which pleases the Father. And let us not be satisfied in merely meeting our own standard of pleasing Him, but keep asking Him for more power to accomplish the mission He has given us. Be resolved to look beyond the sentimentality of this holiday, and walk in the truth of the Word ... For we are not like many, [acting like merchants] peddling God’s word [shortchanging and adulterating God’s message]; but from pure [uncompromised] motives, as [commissioned and sent] from God, we speak [His message] in Christ in the sight of God. That will please Him! 2 Corinthians 2:15 "For we are the aroma of Christ to God among those who are being saved and among those who are perishing..."